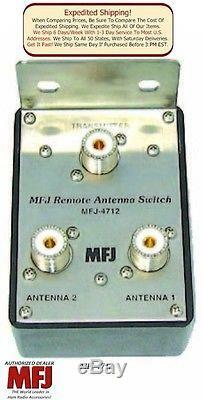 MFJ-4712 REMOTE ANTENNA SWITCH, 2 POSITIONS. REMOTE ANTENNA SWITCH, 2 POSITIONS. This MFJ 2-position remote antenna switch uses a single coaxial feedline to feed two antennas, DC power and control signals NO POWER OR CONTROL CABLE NEEDED. Its perfect for switching from HF to VHF -- no more unplugging coaxial lines from your antennas just to switch frequency -- a quick switch does it for you. MFJ-4712 covers 1.8 MHz-150 MHz and handles 1500 Watts. The compact 4 W x 2 5/8 H x 1 1/2 D inch Outside Switch Box is fully enclosed and weather protected. It also has three quality Teflon(R) SO-239 connectors for transmitter, antenna one and antenna two. It uses a Stainless steel 1 1/2 tall bracket with a U-bolt for masts up to 1 1/2 in. Inside remote control is 2 1/4W x 2 1/2H x 1 1/4 in. MFJ-4712 Remote Antenna Switch with U-Bolt bracket. High Power Capability: Handles 1500 Watts/50-75 Ohm load. Wide Frequency Range: 1-60 MHz. Easy-to-Use: A simple slide switch allows you to select one-of-two antennas. Versatile: Mount the external box outside and control it from the comfort of your station. Standard Connectors: Uses Teflon SO-239 connectors. I don't sell used or refurbished equipment. The item "MFJ 4712 2-Position Remote Antenna Switch & MFJ-4712RC Remote Control & U-bolt" is in sale since Monday, January 11, 2016. This item is in the category "Consumer Electronics\Radio Communication\Ham, Amateur Radio\Other Ham Radio Equipment". The seller is "thehamshop" and is located in Summitville, Tennessee. This item can be shipped to United States, Canada, United Kingdom, Denmark, Romania, Slovakia, Bulgaria, Czech republic, Finland, Hungary, Latvia, Lithuania, Malta, Estonia, Australia, Greece, Portugal, Cyprus, Slovenia, Japan, China, Sweden, South Korea, Indonesia, Taiwan, South africa, Thailand, Belgium, France, Hong Kong, Ireland, Netherlands, Poland, Spain, Italy, Germany, Austria, Bahamas, Israel, Mexico, New Zealand, Philippines, Singapore, Switzerland, Norway, Croatia, Brazil, Chile, Colombia, Viet nam, Uruguay, Saudi arabia, United arab emirates, Qatar, Kuwait, Bahrain, Malaysia, Costa rica, Panama, Trinidad and tobago, Guatemala, El salvador, Honduras, Jamaica.